We highly recommend you read both books - "Work Wonders" outlines some of the practical issues of feeding a natural diet to your pet carnivore - although it is aimed at dog owners, most of the information applies to other carnivores including cats & ferrets. "Raw Meaty Bones" goes into more detail about how & why the current animal welfare system has failed our pets, the damage which is being done to them & the wider community by processed pet foods, and what we can do to fix it. Both books are available to purchase in hard-copy, with all proceeds (not just profits) going to AussieRMB. Funding is an essential part of our work, and how much we can fundraise directly influences how much progress we can make in campaigning efforts. The hard copies make a great gift for friends, relatives or anyone who doesn't have access to the internet; to have on your shelf as an essential reference book; or to give a copy to your local vet. 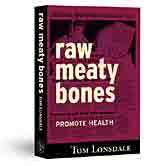 Raw Meaty Bones is $41, and includes postage to anywhere in Australia, if needed. Work Wonders is $20, and includes postage to anywhere in Australia, if needed. To order please email mail@AussieRMB.org.au or phone 0428 7466 20.